A fresh approach to animal rights activism…or is it? White Coat Waste says it’s using unique new strategies to campaign against animal studies…our analysis suggests otherwise. Over the past few months, several news stories have focused on a relatively new animal rights organization, one that we have mentioned in previous posts. 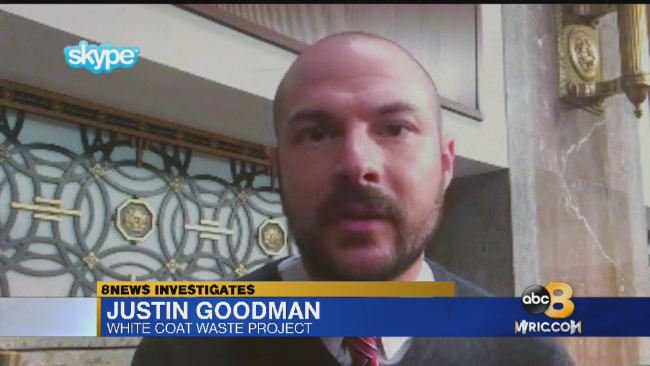 The group, called the White Coat Waste Project, has been portrayed as a “novel approach” to animal activism. In some ways, yes. In other ways, not at all. Campaigned to repeal the Affordable Care Act. Recently, another writer also noted Bellotti’s unique past and how this work could conflict with beliefs other activists might hold. Bellotti’s counterpart is Justin Goodman, who serves as White Coat Waste’s Vice President for Advocacy and Public Policy. Prior to his current role, Goodman’s most noteworthy work took place at PeTA where he served as Director of Laboratory Investigations and Director of Government Relations. Oddly however, his current bio does not include the name of his former employer. Perhaps, Goodman’s noteworthy bio omission is related to the way that WCW portrays itself. Despite repeated claims that animal studies are “wasteful,” they do not refer to themselves as an animal rights or animal advocacy organization. Instead, they portray themselves as a “watchdog group representing more than 400,000 liberty-lovers and animal-lovers.” Their stated goal: to end public funding of all taxpayer-supported research on animals. Of course, if successful, the impacts of such a move would be devastating. It would cripple biomedical research and drastically slow progress in developing treatments. For example, consider current efforts to develop an AIDS vaccine. Only humans and monkeys are susceptible to HIV. This similarity has resulted in significant progress in developing a vaccine through the study of macaque monkeys. And as Research America explains, a vaccine with just 30 percent effectiveness would have a huge impact. It could prevent over 240,000 potentially deadly infections globally in the first 10 years. In addition to saving lives, the vaccine would save an estimated $87 billion in lifetime care costs. Remember, those are the human and financial impacts of a partially effective vaccine to combat just one disease. Now consider WCW’s claims that ending all animal studies would save money. Of course, their logic does not hold up. Such a move would clearly increase the cost of research significantly. Why? Because unlike their counterparts in all other countries that conduct biomedical research, American scientists would be trying to target diseases without a critical component of the research process. It’s a bit like being told you need to drive across the country, but you can only use dirt roads. In other words, it would be a very long, if not impossible journey. What makes WCW’s efforts similar to that of other activist groups? One reason why WCW’s approach is perhaps not as unique as advertised, is their frequent use of many of the standard plays in the animal activist playbook. Conscious omission of critical facts, A review of some of the many profiles published on WCW reveals that they never reference basic research or the crucial role that it plays. These studies often take place in animals and cannot be dismissed because they frequently serve as the basis for new techniques for fighting disease. Focusing almost entirely on large animal studies, which are in fact, much less common than research in rats, mice, fish and other small species. WCW’s most visible campaigns over the past year have focused on monkey research at the FDA and dog research at the VA. Furthermore, an analysis of the WCW blog over the past year (March 2017 to March 2018 – over 80 articles total) reveals that they focused on large animals 83 percent of the time. Doing this leaves the public with a slanted and inaccurate view of how science actually works. Making statements that glaringly conflict with one another. For example, the WCW web site states one reason they oppose publicly funded research is because it offers “little transparency and accountability.” This statement itself is patently false given the huge amount of data available about NIH-funded research. In fact, the NIH has placed an entire searchable database of its projects online. Of course, if transparency is truly a concern for WCW, having research moved from a public setting to a private one, will greatly reduce public access to information. Making misleading statements. WCW’s website claims “We don’t want to ban a single thing.” In a recent article, Anthony Bellotti states that WCW “doesn’t want to ban anything at all.” The group also suggests that defunding all animal studies won’t prevent the private sector from doing this work. The problem with that argument is that pharmaceutical companies depend on information gathered from decades of basic research to develop drugs for market. Their focus is on the end of the research continuum, not the beginning. Taking advantage of limited public understanding. Information on WCW’s website paints publicly-funded studies as “useless” claiming that “big pharma and others are responsible for most medical innovations.” In a recent article that he authored, Anthony Bellotti claimed that the private sector is “responsible for the lion’s share of medical innovation.” Statements like these, attempt to take advantage of limited understanding by Americans about how health research works. It’s a system where key findings – often revealed through basic research – mostly take place in university labs. These findings are later developed into commercialized treatments in private pharmaceutical companies. Drug companies aren’t designed to do basic research. Therefore, taking away one part of the research process, will hurt the other. They overstate the capacity of alternatives. WCW proposes redirecting public funding for animal studies to other initiatives such as “organs-on-a-chip,” while ignoring the fact that even these technologies will continue to depend on research with animals and animal tissue to inform their development and secure approval from the US Food and Drug Administration. You read that correctly. The solutions WCW are proposing aren’t currently approved and it may be many years before pharmaceutical companies can rely on them for drug development. Use of these technologies for basic research is even more problematic because “chip” designs will always be limited by our existing understanding of whole organisms; and we still have a huge amount to learn. Eliminating animals from the research process will also eliminate the very technologies proposed by WCW and others to replace them. So, if WCW’s case against animal studies is primarily based on recycled animal rights talking points, should we be concerned? We certainly should. It is widely accepted that the group played a key role in the FDA’s decision to end nicotine studies in monkeys and of course, nicotine addiction is no small problem in the U.S. Despite the large number of smokers who would like to quit, only 6 percent are able to do so each year. Also, according to the American Lung Association, tobacco use remains the leading cause of preventable death and disease, killing close to half a million people each year. WCW is also currently focused on research taking place in the VA, aimed at helping all Americans. They have even convinced well-meaning legislators and veterans to take up the cause. While still a small organization, White Coat Waste does appear to be making some headway in the crowded field of animal rights groups. If Americans aren’t careful, WCW’s big plans will create big problems for basic research, and the medical progress that relies on it. In tweeting this story and selectively quoting this particular excerpt to followers, WCW not only admits it is an animal rights group, the organization also acknowledges that it is using “taxpayer dollars” as an issue to frame their anti-research argument. Next Next post: Research Roundup: Link between body temperature and obesity found, key brain protein implicated in Multiple Sclerosis and more! I wouldn’t call the development and safety tests of new medicines either a giant failure or wasted money. Those “human-relevant methods” are a whole range, such as animal studies, computer studies, human studies, in vitro studies etc – all used together. We do not have a blanket replacement for animal studies.